The Mo-ho chih-kuan (Great cessation-and-contemplation) by T’ien-t’ai Chih-i (538–597) is among the most influential treatises in the long history of Buddhist scholarship. It is known for not only its brilliant insights, but also its systematic and comprehensive treatment of the Buddhist tradition. Clear Serenity, Quiet Insight is the first complete, fully annotated translation of this monumental work by one of today’s foremost scholars on T’ien-t’ai (Tendai) Buddhism. The Mo-ho chih-kuan offers a superb outline of Buddhist tradition that covers the full scope of its practices—from sitting or walking in meditation to chanting the Buddha’s name to defining the tenets of ethical living—and its teachings—from the “Hīnayāna” Āgama texts to Mahāyāna sutras and treatises to various Buddhist and non-Buddhist (indigenous Chinese) beliefs. As a cornerstone of T’ien-t’ai study and practice, the Mo-ho chih-kuan was poured over by generations of T’ien-t’ai exegetes and aspiring students, but it also garnered the attention of Buddhist monastics and laity well beyond the confines of the T’ien-t’ai school, including adherents of the Ch’an and Hua-yen schools. Wherever T’ien-t’ai and other homegrown Chinese traditions of Buddhism traveled—Korea, Japan, Vietnam, and beyond—the Mo-ho chih-kuan traveled with them, becoming a genuine classic of East Asian Buddhism. I'd be happy to start a study thread on the text if enough people are keen on the idea. The chapters themselves are substantial, so perhaps I could post 'a chunk' per week and work our way through. Obviously how large 'a chunk' would depend upon how extensive the commentaries had been on a particular section. I have an addition of the text that includes the original text, the commentaries of Zhanran, Houchibo Shoushin, Chikuu, and Shudatsu (all in classical chinese). I've also got the edition which includes modern Japanese by Ikeda Rosan. I could use these, my own notes taken during monastic training /seminars, to flesh out Professor Swanson's mammoth achievement. Being in Japan, and working in Tendai, means that it is also possible for me to seek clarification on anything should we run intosome issues. The book has only just been released, and it appears that quite a few have had delays and are yet to receive their copy. With this in mind, if we were to do this, it might be wisest to wait awhile until the text has a wider audience. Perhaps we could tentatively say a start to the programme mid-January? That might provide a window for the text to circulate, and ensure thst the Christmas/ New Year period isn't an issue. A study group sounds great! Rev. Jikai please count me in my copy of Maha Shikan should be here in a week! Jikai, this would be wonderful. I'd be happy to start a study thread on the text if enough people are keen on the idea. Reverend that is a great idea. I am looking forward to it. Ok, sounds like we have something here. I'll start thinking about the specifics/ how to conduct the thread, and get things moving. In the meantime, enjoy your reading everyone! Has anyone actually got a copy yet? I placed my order with amazon back in July. They promised delivery 18-20 November. They've just emailed me to say they haven't got a clue when they are going to have it in stock. We have already waited 1500 years for a translation so I guess a few more days won't make much difference. Frustrating though. Probably shipping drama. It may well accidentally be in France currently, for instance. I am sure we will all get what we paid for eventually. Some prelim comments... Not liking the Donner Stevenson intro. I'm realizing the divide between Swanson/Donner/Stevenson and Ng/Ziporyn is quite significant. FWIW, my impression is that the fault line is between Japan oriented scholars and China oriented scholars. Anything in particular you didn't like? In general I found it fairly consistent with the tradition. You are right in my mind to identify a divide of sorts between Stevenson, Donner, and Swanson on the one hand, and with Ng and Ziporyn on the other. But I wouldn't attribute it to Japanese vs Chinese educated scholars. In my experience the majority of Chinese and Japanese Tiantai/Tendai scholars are in surprisingly consistent agreement on the majority of early Tiantai - as it pertains to doctrinal discourse. Of course, it is a muddier matter when it comes to the history of the tradition. The divide in this case, to my mind arises from scholars with fairly orthodox positions on the one hand (Stevenson, Donner, Swanson) who tend to be fairly 'conservative' in their ideas. And scholars who attempt to 'break new ground' as it were (Ng and Ziporyn). Ng and Ziporyn are quite different though. Ng finds himself on this end of the spectrum because he attempts to 're-orient' or perhaps more charitably 're-focus' Tiantai studies by identifying what he feels are under appreciated concepts (like the Middle Way- Buddha Nature). This sets him apart from the tradition somewhat. Ziporyn is not doing the same thing, but nontheless doesn't quite fit in with what I've described as the 'conservative' approach. Ziporyn's views are consistent with later Tiantai developments which is why he draws most consistently from Siming Zhili, and Zhanran. What Ziporyn does which sets him apart somewhat in his approach, is that he treats Tiantai as would a Philosopher. That is, he attempts to unpack and discuss the ultimate conclusion of x,y,z, and show how it relates to standard philosophical approaches/ questions, or contemporary concerns not of issue to the system and tradition itself. Lest I be misunderstood, I'll say that I value the works on both sides of the divide, and am not criticising one or the other. Likewise, I am not saying that the more orthodox does not innovate, nor that the more progressive scholar cleaves insufficiently to the tradition. There are simply tendencies. Maybe you can help me hash this out. I don't have the text before me, but it was the presentation of the Three Truths, wherein they seem to suggest that the conditioned and ultimate are reconciled into the middle which subsumes them both. My understanding (I believe per Ng) is that this is one iteration of the Separate Three Truths. IIRC, the three truths are like Isvara's three eyes - ؞. None is above the other, all are perfectly integrated, such that if one sees the conditioned, one also sees the ultimate and middle; if one sees the ultimate, one also sees the conditioned and middle; if one sees the middle, one sees the ultimate and conditioned. Donner and Stevenson refer to this a couple paragraphs later, so it seems odd that their first description would weight the middle so heavily. I conceive of the Integrated Three Truths as walking, chewing gum, and clapping at the same time. There is no transition, so to speak. All three truths are immediate and simultaneous. In contrast, we have the Separate Three Truths - in one iteration, seeing one of the three, the other two truths are implicit but not readily apparent; alternatively, the middle is some sort of negotiation between the two truths; and alternatively again, the middle is a higher level truth that subsumes the other two (what Donner and Stevenson seem to suggest). Coming from a Nichiren background, my view may very well be colored by Zhanran's interpretation of Zhiyi. 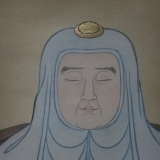 Zhanran figures very prominently in Nichiren's writings - when Nichiren quoted Zhiyi, he often qualified the passages with Zhanran's commentary. Does Zhanran not figure as prominently in Tendai? IIRC, Saicho received the Tendai lineage from Zhanran's direct disciple. On the Middle-way Buddhanature emphasis by Ng - is he breaking new ground or bringing to the fore the mystical aspect of Buddhanature that seems to be ignored in the more academically oriented scholarship? The Middleway-Buddhanature that Ng identifies is the Buddha who is constantly thinking how to quickly cause beings to attain the body of the Buddha in response to living beings; ie. the Buddha as described through the convention of the 4 siddhanta. This dynamic Buddhanature doesn't seem to sit well with secular scholars - and hence they tend to interpret Zhiyi in a way that's closer to the dry version of Madhyamika. I don't have a lot to stand on with this, but I suspect the secular scholars are closer to the Critical Buddhists on the spectrum between mysticism and that bone dry Madhyamika ("Buddhism is Criticism!") they seem to assert is "real" Buddhism. I don't have much to go on in saying this, but I'm not sure that Zhiyi's innovation of the Three Truths is simply a misunderstanding of Madhyamika due to a bad translation. I suspect its also a synthesis of Yogacara sensibilities, filling in the full Middle that is suggested in Madhyamika analysis. Anyways, you can probably see which way I break in terms of the "conservative/innovative" divide. As a general suggestion to those who will are following along and would like some more details on the divide Jikai and I are discussing above, as a companion to Swanson's translation, you might consider picking up Ziporyn's Emptiness and Omnipresence. Ziporyn's iconoclastic, whimsical style I think leaves a bit to be desired, but he offers a fairly comprehensive picture of Tientai. Other than Hurvitz' study of Zhiyi, its the only widely available text that presents an overall view of Tiantai. Jikai, do you have any other suggestions on getting the "big picture" on Tientai? I don't have the text before me, but it was the presentation of the Three Truths, wherein they seem to suggest that the conditioned and ultimate are reconciled into the middle which subsumes them both. Forgive me for butting in, but what you are experiencing now, is something that I have also experienced, and IMO it is a very common byproduct of some of the ways that the three truths are sometimes described/explained. Case-and-point, you do not believe the above, but at times, it has seemed to me at different times in the past like you were arguing that you did, all the while paradoxically not maintaining that position(!). I do not yet have the text yet, but am getting it soon, I will see if I have a similar experience reading the section.